A healthy lawn reflects well on any homeowner. Unfortunately, some of the traditional methods that are used in keeping grass green and lush can be very harmful to the environment. Most homeowners rely on the heavy use of chemical fertilizers and insect repellents to keep their lawns in top shape. All of those chemicals are eventually washed down the sewers and directly into the local water table where they can seep into the drinking and bathing water. Many homeowners also use gallons of water every week to keep their lawns looking green and healthy, which can cause a strain on water resources. It is possible to grow a healthy lawn without harming the environment or using excessive amounts of fresh water. If you approach lawn care from an organic point of view you can cut down on the amount of time you spend tending your lawn as well as the amount of money you spend on lawn supplies. Organic lawn care takes advantage of natural elements that were designed to help things grow without any chemical support. This type of lawn care is meant to work in harmony with the ecosystem that is already established through the climate, soil, and plants that thrive in your area of the world. Chemical fertilizers are the most commonly used lawn additives in North America. They are also some of the most harmful for the environment. You can get the same amount of nutrients to feed your lawn from a homemade compost bin. Creating your own compost is as easy as taking out the trash. All you have to do is designate an outdoor receptacle where you throw away all of your organic waste. Any item that can decompose will help create the nutrients that your lawn needs in order to thrive. As the organic matter in your compost pile decomposes, you can collect it to spread over your lawn the exact same way that you would use fertilizer. Another natural lawn building alternative is manure, which can be bought at any garden store or home improvement store. 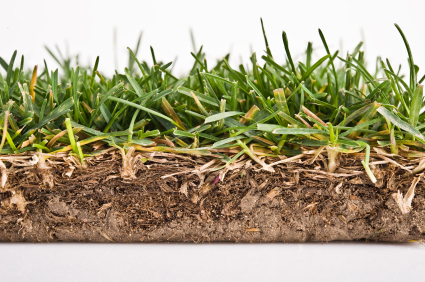 It is nearly impossible to have a healthy lawn if you don’t begin with the right kind of soil. You can buy a simple pH testing kit from a local home improvement store so that you can see how acidic your soil levels are. If there is too much acid in the soil, you can sprinkle lime throughout your lawn to correct the problem. If your soil has too much clay it will not hold the right amount of moisture to keep your grass growing properly. The best thing to do for clay soil conditions is to aerate the yard. There are aeration tools that do the job nicely without too much effort. Using an organic compost on a lawn that has been recently aerated will provide the maximum growing environment without the need for expensive and harmful chemicals. Your selection of grasses also has a direct impact on how much water and fertilizer you will need to use. The most common grass used in North American lawns is Kentucky Bluegrass. While it creates lush, beautiful lawns, Bluegrass requires quite a lot of water to thrive. If you live in an area that doesn’t receive massive amounts of rainfall during the summer, you will find that you have to water your lawn at least once or twice every day of the summer. The simplest way to reduce the amount of water you use for your lawn is to plant grass that was designed to be healthy within your area’s natural ecosystem. Almost every area of North America is home to several different types of grasses that create beautiful lawns. A lawn that is well suited to your climate will require far less maintenance and upkeep than a lawn that requires you to create an artificial climate to keep it healthy. Mowing the lawn is a normal part of keeping it looking beautiful. Most power mowers give off quite a lot of pollution while they are running, however. You can reduce the amount of fuel that you consume as well as cut down on harmful emissions by mowing your lawn less often. Keeping the grass a little bit longer will also keep it healthier and greener because the roots will be less likely to burn in the hot sun. Allowing your lawn to grow a little longer than average will benefit the grass as well as the environment. 100 pounds of lime to every 1 ,000 square feet.